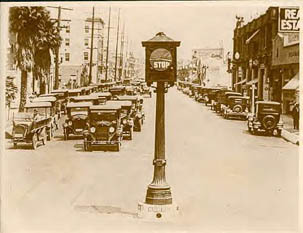 For more than 80 years, electrically operated signals have been used to control vehicular traffic in the United States. The earliest signals were manually operated. Police officers used "switch stand" type devices to change the red and green targets and lights. It was not long, however before simple automatic controllers were developed to relieve police officers of this duty. 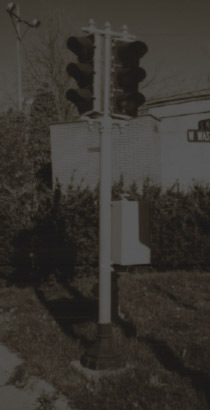 To view some of the earlier types of traffic control devices and signals, click below. 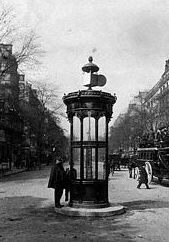 Since then, traffic signal control equipment has undergone continual improvement. The earliest signal controllers used motors and gears to time the durations of the signal indications, and direct descendants of these controllers can still be found in use today. However, the revolution in electronics has brought microprocessor-based signal control equipment that is far more powerful and flexible than anything dreamed of just a decade or two ago. All contents © 2001-2015 by Signalfan.